Advanced Dental Care provides Free Invisalign consults to any patient who is interested in achieving a healthier, more attractive smile! Invisalign can treat many common conditions such as gaps, overbites, underbites, open bites, crowded teeth, overlapping teeth, and crossbites. During your consultation, you will get to meet our entire staff and make sure you are comfortable with our office. Dr. Jorgenson will conduct a comprehensive ortho exam and determine if you are a candidate for Invisalign. You will have the opportunity to ask any questions and see photos of real results! Once you have decided you want to proceed, the real fun begins! You can start Invisalign the same day as your consult or come back when you are ready. During the first appointment, our wonderful dental assistants will take photographs of your mouth from several angles and take impressions. This information is necessary for the Invisalign lab to create a complete model of your mouth. The Invisalign lab will then create a Clinical Plan just for you! Invisalign sends your plan to Dr. Jorgenson for review and to ask for any modifications. Once approved, Invisalign will create a series of custom trays that you will wear from start to finish. Each treatment plan is different and the number of trays just depends on how much and what kind of movement your teeth need. On your second appointment, Dr. Jorgenson will deliver your first set of trays (yay!) and explain your personal treatment plan. Again, you can always ask questions during any appointment and we are available 24/7 by phone and email for your comfort. Over the course of your treatment plan, you will come in as scheduled to receive your next set of trays and to ensure your teeth are moving according to plan. During this time, you should wear your trays as much as possible for the best result. You can take the trays out for short periods of time to eat and to brush and floss, but they should go right back in when you are done. We also offer a treatment that can be done in combination with Invisalign to speed up your treatment time. Ask about Propel during your consult! 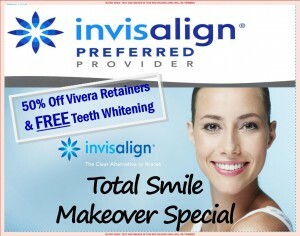 To celebrate the wonderfulness of Invisalign, Advanced Dental Care is offering a fantastic special during all of April. If you start your Invisalign treatment in April, you will receive 50% Off the Vivera Retainers AND Free Epic Teeth Whitening! Your smile will be more beautiful and radiant than ever! Dr. Jeremy Jorgenson is the owner/dentist of Advanced Dental Care located at 3033 Bristol St. Ste. AA, Costa Mesa, CA 92626. For your FREE Invisalign consult, please call us at 714-793-0686 or by email at info@mycostamesadentist.com. We are available 24 hours, 7 days a week for your convenience. You can also schedule your appointment online at www.mycostamesadentist.com!